Roger Crowell, 20, KIA when an armored personnel carrier he was driving was hit by rockets in Vietnam. 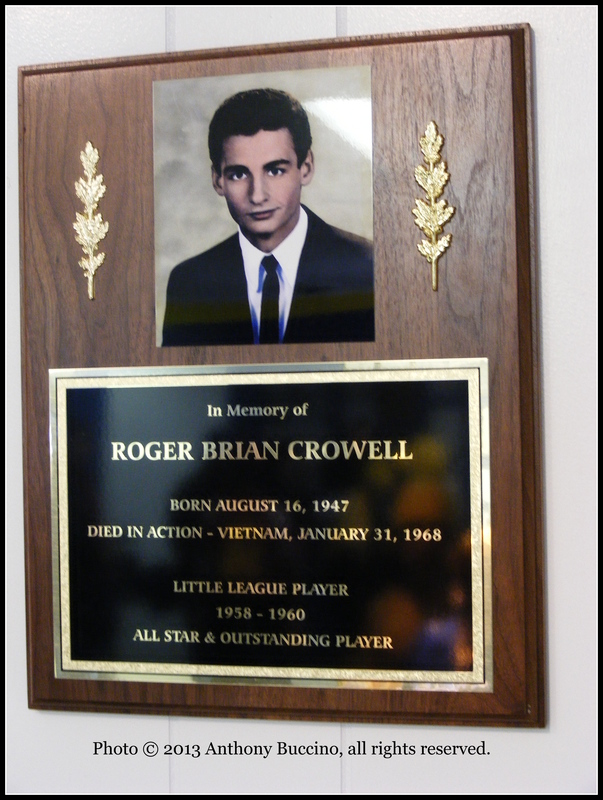 Roger B. Crowell was born on August 16, 1947, to Mellville and Grace Crowell. His home of record is Belleville, N.J. He had two siblings, Winfield and Della. Being an avid sportsman, Roger enjoyed basketball, baseball and football. He also loved working on racecars with his brother. 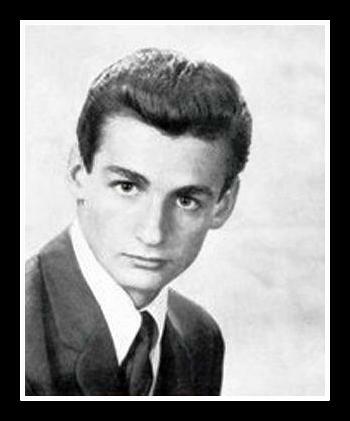 He graduated from Belleville High School in 1965. Roger and his wife, Gail, had one son, Roger. He served in the US Army and attained the rank of Specialist 4 (SP4). He was assigned to 1st Platoon, C Troop, 3rd Squadron, 4th Cavalry Regiment, 25th Infantry Division. 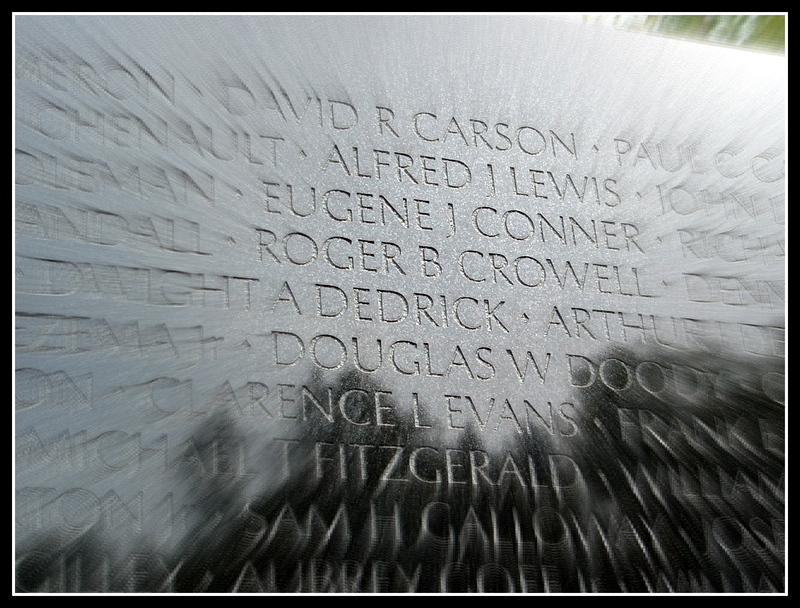 Crowell was killed in action on January 31, 1968 when an armored personnel carrier he was driving was hit by rockets. He was awarded the Distinguished Service Cross, Bronze Star, two Purple Hearts, the Combat Infantryman Badge, and the South Vietnamese Cross of Gallantry. Sources: Roger Crowell-Nugent (son), newspaper clippings and NJVVMF. 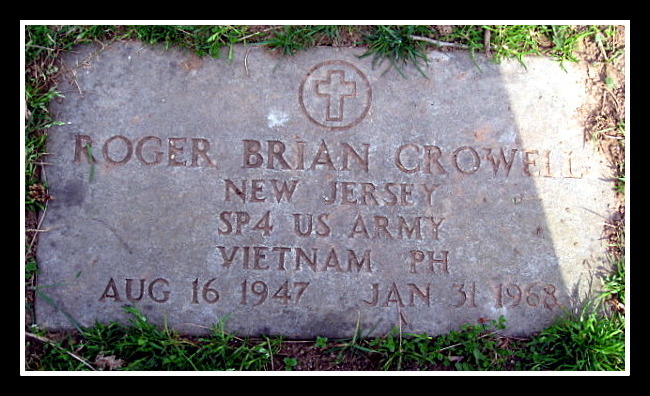 Specialist Fourth Class Roger Brian Crowell (ASN: US-52687737), United States Army for extraordinary heroism in action in connection with military operations involving conflict with an armed hostile force in the Republic of Vietnam, while serving with Troop C, 3d Squadron, 4th Cavalry, 25th Infantry Division. Specialist Four Crowell distinguished himself by exceptionally valorous actions on 31 January 1968 while serving as a tank driver of an armored platoon on a reaction mission during the communist Lunar New Year offensive. His platoon was called to reinforce friendly elements engaged in a fierce firefight with a regimental size force of Viet Cong and North Vietnamese Army soldiers who had penetrated the Tan Son Nhut Air Base perimeter. While moving into the battle site, the platoon was subjected to savage enemy rocket, automatic weapons and small arms fire. Specialist Crowell's tank was struck by three anti-tank rockets, and his commander directed the crew to evacuate the disabled vehicle. Heedless of his safety amid withering hostile fire, Specialist Crowell unhesitatingly left the driver's compartment and climbed inside the tank. Alone, he quickly loaded and fired eighteen devastatingly accurate cannon rounds on the attacking insurgents. When continuing enemy rocket fire rendered the main gun inoperable, Specialist Crowell fearlessly exposed himself to the relentless fusillade and raked the hostile positions with a hail of bullets from the tank's machine gun until he was struck by enemy small arms fire and instantly killed. Specialist Four Crowell's extraordinary heroism and devotion to duty, at the cost of his life, were in keeping with the highest traditions of the military service and reflect great credit upon himself, his unit, and the United States Army. Roger B. Crowell Way dedicated in honor of Roger B. Crowell on March 26, 2016. (Feb. 15, 1968) -- A military guard snapped to a salute as pallbearers removed the body of 20-year-old Roger Bryan Crowell from Holy Family Church in the bitter cold last Sunday morning following funeral services there. Young Crowell is another Belleville victim of the Vietnam conflict. He was a product of the Belleville school system and his parents have been long-time residents of 100 Tiona Avenue. The telegram of regret from the Army states that he died of gunshot wounds suffered during an engagement with the enemy Vietcong forces on Jan. 31. The body was flown back home to Belleville. 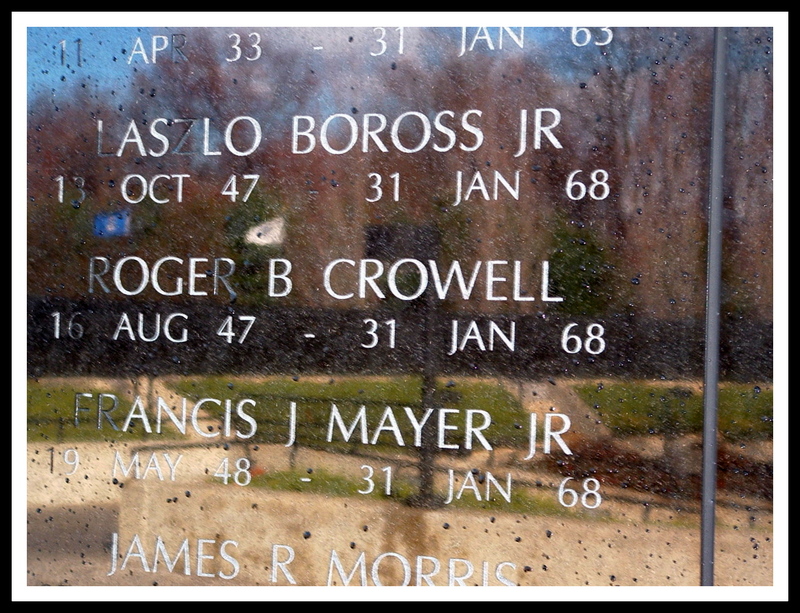 Crowell was known to his family by his nickname "Rog." He was an outstanding Little Leaguer and winner of many trophies for athletics. He attended Grammar School 5 on Greylock Parkway, Belleville and went on to Belleville High School where he was especially active in football, baseball and basketball. He graduated from BHS in 1965. Crowell was engaged to be married for several years to Gail Corino, his high school sweetheart. A draft notice precipitated the marriage but because their marriage was kept secret, the ceremony was held at three different times in as many different churches - in June, September, and December 1966. The young couple had only four days plus Roger's leave time, to be together in all their married life. Their son, Roger Jr. is now 10-months old; he was born in Clara Maass Memorial Hospital. Roger Sr. was able to obtain leave and arrive to be with his wife and new baby the day after the birth. In his letters home from Vietnam, Crowell shows that he still had the same hopes and interests in his family's activities that he had before he became a soldier. "Hello Brother, How's things going back home? Good, I hope. I hear you put the engine in Vinnie's car (a racing motor). How does it go? Mom said you were over to get my address about a week ago so maybe I'll be hearing from you soon. We just got back form a big operation last night and boy did it feel good to sleep on a cot and have a shower. I guess Mom told you that they finally made me a Specialist 4th Class. It's about time, especially after 11 months of Pfc. What have you been doing lately? Are you still working in the schools? Well, there isn't much more to write about ..."
"Hello Mom and Dad. I guess it's been quite a while since the last letter I wrote you. Everything is okay here. I came back to Cu Chi just in time to see Bob Hope. They had a pretty good show and it really gave the guys a good time so it kinda made up for not being in on Christmas..."
Father Robert Cassini officiated at the services Sunday at Holy Family. 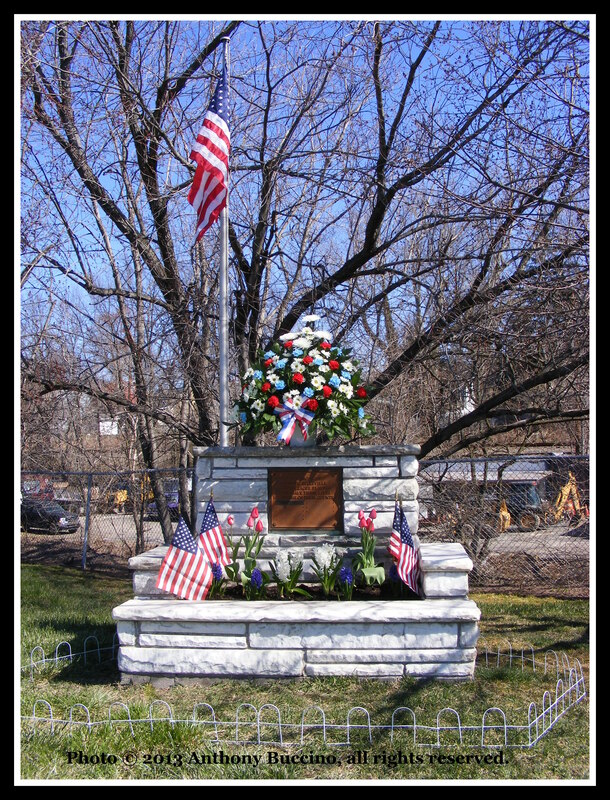 Burial was at Holy Cross Cemetery, North Arlington. He is survived by one brother, Winfield R. Crowell, of Newark, who recently returned from active duty in Vietnam; and by a sister Mrs. Della Dranow of Verona, who has two children. Many flowers were received from his old friends and acquaintances by Landolfi Funeral Hope for Funerals, Union Avenue, Belleville, where the body was on view. Mayor Kenneth D. Smith, the Town Commission, civic and veterans' organizations and local residents have extended their sympathy to the grieving family. 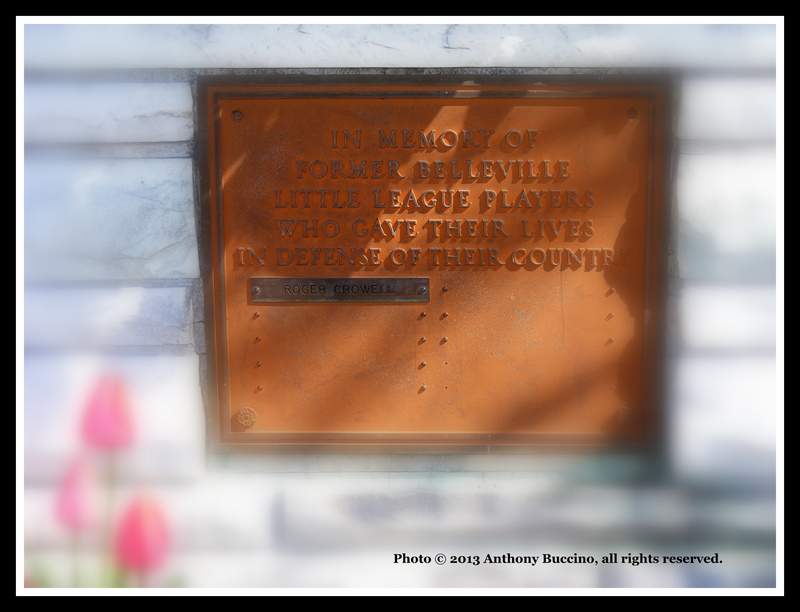 Belleville Little League Memorial, Belleville, N.J.
"On 31 January Troop C (-) reacted to Tan Son Nhut Air Base. The Troop was ambushed outside gate 051. The Squadron reacted with Troop D and Troop B (+). The results of action was 3 APC completely lost, 1 Tank completely lost, 7 APC damaged, 14 US KHA, 64 US WHA, 309 VC KIA (BC), 24 VC PW ..."
Bravo Troop lost three men, PFC Gerald L Fitts ; PFC Everett W Johnson Jr; and SP4 Vernon C Wilderspin. Delta Troop lost one man, SP4 Edward M Pike. Tiona Ave. at Nolton St.